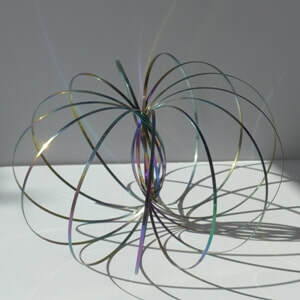 The Kinetic Flow Rings are constructed from a single continuous strand of steel which coils up flat and pops open into a sphere. It spins whilst falling and with momentum it will even go up. You can put your arm through the coils and it will roll up and down your arm and you can even pass it to your friends by holding hands. It will also work on tubes of cardboard or a rope. ​They are available at a lot of retailers,including Amazon.